Anyway, Sunday’s post should go up as normal. And if you’ve got any interest in my Sailor Moon comments, please weigh in on the question I asked on yesterday’s post. Daring Do, what’s the matter with you? You don’t act like the other ponies do. It’s December 7, 2013. The top song is still Lorde’s “Royals,” and the top movie is Frozen, which combines a much-needed fresh take on the Disney princess-fairy tale-musical complex with stunning visuals and surprisingly lackluster music. In the news, Pope Francis assents to the creation of a permanent, expert commission to investigate sexual abuse of minors within the Catholic Church, Nobel Prize-winning anti-apartheid activist and former President of South Africa Nelson Mandela dies at 95, and Shanghai has record levels of smog while the U.S. has record levels of snowfall. In ponies, it’s the “Daring Don’t” by the reliably unpredictable David Polsky. This episode is, frankly, bizarre. Even the premise is notably odd: previously presented as a fictional character from a series of books enjoyed by Twilight Sparkle and Rainbow Dash, Daring Do is in fact real, and author A.K. Yearling is her secret identity. In other words, this episode is not merely about revisiting a past episode and one-shot characters, which the show has done before–indeed, every episode thus far this season has involved the return of past elements, with the premiere heavily referencing the first- and second-season premieres while following up on the consequences of the third-season finale, and “Castle Mane-ia” returning to the Castle of the Two Sisters from the first-season premiere. This episode, however, revisits the past in a somewhat different way; it recontextualizes the prior Daring Do episode, “Read It and Weep,” such that that episode can no longer be read in quite the same way as before “Daring Don’t.” Where previously the Daring Do and Rainbow Dash segments represented two different fictional worlds that paralleled one another, now the Daring Do sections are flashbacks. This is important because, as I rather broadly hinted in my deliberately obscure article on “Read It and Weep,” the two alternate worlds could be read as alternate paths for the show. The Daring Do story is a might-have-been, a what-if, to whit, “What if instead of focusing on characters and their relationships, a My Little Pony cartoon instead focused on adventure and plot.” Like its most obvious inspiration, the Indiana Jones movies, Daring Do evokes the adventure serials of the Golden Age of cinema. There is every reason to believe that our putative My Little Pony: The Adventures of Daring Do would be a straightforward action show with at least one multiply recurring villain and perhaps story arcs; certainly that seems to be what the conversations between Twilight Sparkle and Rainbow Dash in this episode, with their rapid-fire discussion of continuity points, imply. But as we perhaps should have seen in “Read It and Weep,” and definitely see here, there is a fundamental incompatibility between Friendship Is Magic and The Adventures of Daring Do, which can be summed up by Daring Do’s insistence that she works alone. It’s right in the title: Equestria is a world that runs on the magic of friendship. Only a pony who understands that can be a protagonist; any being that doesn’t must either be an antagonist or come to learn the error of there ways, as Twilight did, Daring Do does, and Discord is beginning to. Discord points to the other problem. If the magic of friendship is to work within the show, then a villain must become less villainous with every appearance. Discord’s transition from menacing Trickster God to manipulative quasi-ally is an inevitable consequence of his popularity and resulting recurrence; the alternative would be for him to be immune to the magic of friendship, and the nature of the show is such that no one can be entirely immune to that. One can only be defeated by it, like Chrysalis or Sombra, or come to accept and embrace it, like Nightmare Moon or Discord. But a key factor in making an adventure serial work is to make a compelling, interesting, and decidedly evil villain, who is constantly foiled and yet returns. Of course there can be one-shot villains, but the recurring nemesis is near-automatically more interesting. It seems Ahuizotl and, to a lesser extent, Caballeron (quite possibly the greatest horse pun in the show’s run to date) are Daring Do’s. All of which serves to make the decision to merge the worlds utterly baffling. Daring Do worked, and worked well, as a fictional hero for Rainbow Dash, a way for her and Twilight Sparkle to bond, and a counterpoint for the show’s normal themes. By absorbing her into the “reality” of the show, that last is severely destabilized, and the resulting story simply doesn’t work. 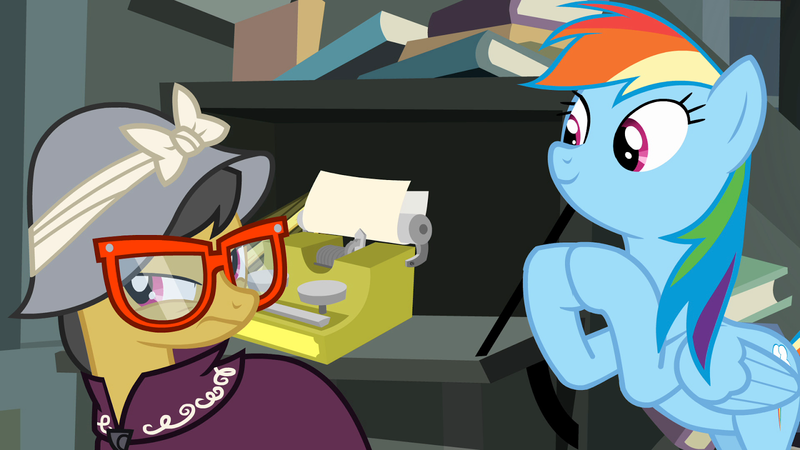 Where “Read It and Weep” balanced two complete stories, Daring Do’s and Rainbow Dash’s, by alternating between parallel scenes in them, “Daring Don’t” awkwardly stitches a complete Daring Do story onto an incomplete Friendship Is Magic story, without ever resolving the latter. At first the episode seems to be headed down a clear path: the Mane Six are stalking an author, while Rainbow Dash and Twilight Sparkle engage in constant attempt to one-up one another’s knowledge of the series. It seems to be building toward a solid double-moral: for the kiddies, it’s about enjoying what you enjoy without having to prove you have the largest and most turgid fan-brain on the block. For the adults, it’s that much-needed lesson, as well as an equally needed lesson about fan entitlement, that enjoying a work gives one absolutely zero ownership over it, no matter how large and turgid one’s fandom may be. All of that falls to pieces the moment A.K. Yearling is revealed to actually be Daring Do. Suddenly there are lost temples–to what gods?–in mysterious valleys, magical ancient puzzles, and a villain who seeks not to darken or torment or enslave, but to kill. A completely different show, The Adventures of Daring Do perhaps, has broken through. Is this, perhaps, the qlippoth, the dark world, which broke through into the light in the season premiere? We have continuity now, yes, and adventure, and exciting chase sequences, but we also have a disjointed episode unsure of what it wants to be, Rainbow Dash forgetting that she has helped save the world multiple times, and a villain far more coldly destructive than any before. Maybe it’s us. Maybe the continuity implied by the box in the premiere, the action, this episode’s sudden shying away from telling off overzealous fans, are all part of the show trying to create a more welcoming space for those same fans. We can only hope not. But something, something is breaking through, altering the show around. For the last two episodes, all evidence has been that this alteration is for the worse. We can only hope that either things change for the better, or the intrusion ends. Next week: Signs of hope. I actually quite liked the fact that Daring Do turned out to be real. If only because I was worried that it was going to turn into a 1990s “Flash The Wonder Dog/Where No Duck Has Gone Before” lecturefest, with the customary message that “Your heroes are frauds and you're an idiot for being inspired by them” which all those episodes in the Disney Afternoon lineup seemed to imply. I certainly don't think an episode about embracing your own greatness is counter to the message of the show, particularly with the way it's phrased at the end. See, what I wanted was “stop acting like you own something just because you like it.” “Your heroes aren't real and that shouldn't matter to how inspired you are by them” would also have worked for me. I don't think embracing personally greatness is contradictory to the message of the show exactly, but I feel like the way it gets there is more consistent with the show fans like to pretend MLP is than the show it actually (usually) is. I mean, it's arguably what the next episode is about to, but the way it handles it is IMO much better.